At a middle school in this seaside town, the unthinkable has happened, placing a bewildered community in the national spotlight. Stuck at home in a state of shocked limbo, Julie and Zander, two thirteen-year-olds, try to make sense of the chaos they witnessed, their awkward crushes, and an infinitely more complicated future – but the grown-ups are no help at all. An urgent response to our times, This Flat Earth is a startling and deeply felt story of growing up in our confounding world. 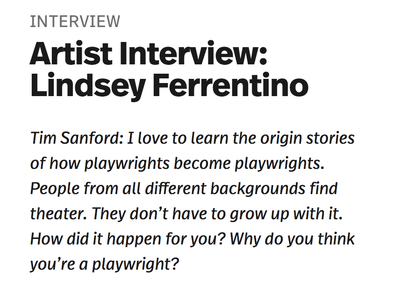 Lindsey Ferrentino's most daring play to date, with profound and essential subjects. ​There is no denying the urgency of this work. 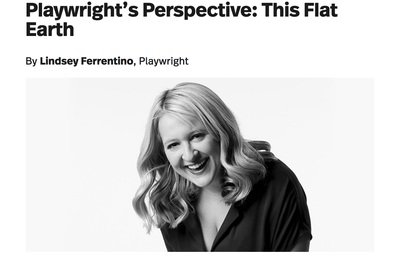 She is bravely attempting to contextualize 21st-century horrors within the sort of existential framework in which Thornton Wilder and Edward Albee specialized. The prolific Ms. Ferrentino has already established herself as a dramatist willing to wrestle with overpowering contemporary subjects. 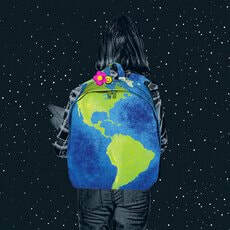 'This Flat Earth' traces childhood fears no parent can allay. Very sincere. Noble intentions and sensitivity. Timely. Subtle and eerily timely, This Flat Earth provides a personal echo to current events. Quietly powerful drama. [This Flat Earth] is a crucially relevant show that asks tough, intelligent questions. Ferrentino bravely addresses the conversation without being didactic or preachy. All-too-timely. There are felicitous touches to this latest play from the talented Ferrentino, The play quietly expresses a hope that school shootings may someday be a horror that exists only in the past. 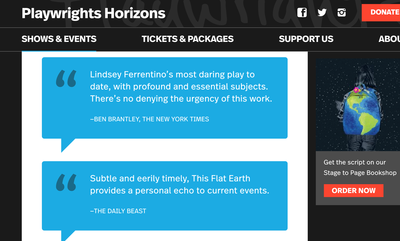 This Flat Earth, a poignant and distressingly timely new play by Lindsey Ferrentino, takes on the question of how kids and parents navigate catastrophe’s aftershocks with an illuminating — and refreshing — frankness. Ferrentino intuitively grasps the slippery ways kids (or anyone) might deal with collective trauma. The play’s mix of perennial school-day dilemmas with a shooting’s tragic aftermath draws us closer to imagining what often feels so unimaginable.